Uría Menéndez in Spain and Portugal. Communication and understanding between our firms is peerless. Each is considered to be a market leader in its respective jurisdiction. Together, we have an unparalleled track record in cross border transactions, and we constantly strive to raise the benchmark of best practice in global legal services. 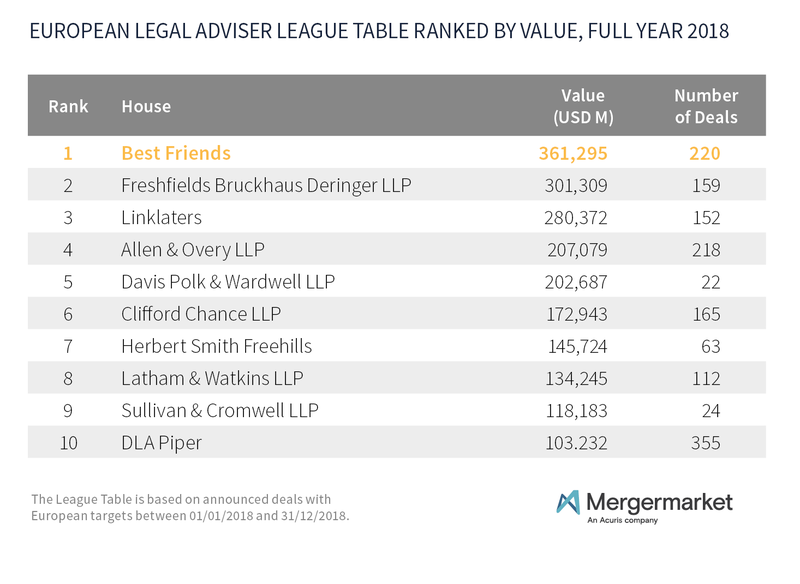 In 2018, our Best Friends group acted in 220 deals worth an aggregate of more than US-$ 361 bn. CLARITY. Every jurisdiction, every client, every situation is different. Seeing our clients’ challenges in their full context requires an acute appreciation of the relevant businesses, markets and jurisdictions. We believe this depth of understanding cannot be replicated. But it can be shared. AGILITY. We build specific teams according to individual issues and requirements and increase effectiveness by putting the right minds in the right place at the right time. This flexibility gives our clients the highest quality advice possible. COHERENCE. Our clients work with a single united team. Focused and consistent at every level, our advice is fully aligned across all jurisdictions. This coherence affords our clients continuity, consistency and confidence. And offers them good value.